In a small bowl, stir together the pesto and red chilli puree, using half stir into the Quorn pieces, retaining the remainder to spread onto the soccas when cooked. To make the soccas, combine olive oil, vinegar and milk in a medium bowl and stand for 2 minutes, then stir in the mustard, salt, pepper, garlic basil and thyme. Stir in flour and baking soda until combined and stand for 15 minutes. Brush a 24 cm/9½ in non stick frying pan with oil. Heat frying pan over a medium high heat add a quarter of the batter, using a ladle spreading the mixture until it covers most of the surface. Cook for 5-6 minutes on each side or until the socca is golden brown. Carefully turn and cook the other side, until golden brown. Place the soccas onto greaseproof paper on a baking tray. Repeat with the remaining batter. Mix the chopped capers into the remaining pesto and chilli mix, spread the mixture on to each socca base. 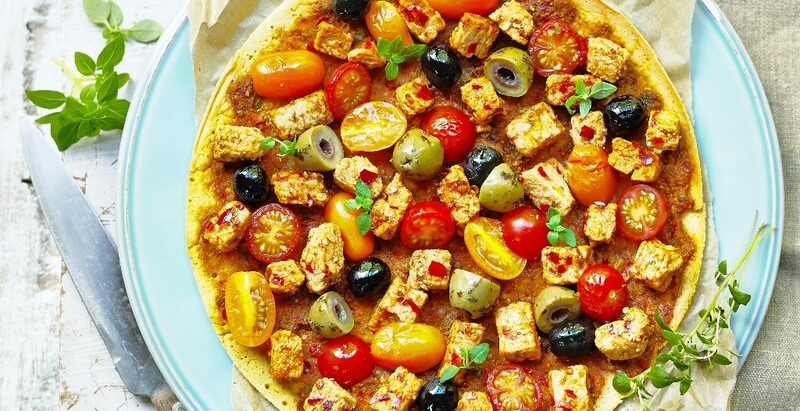 Top with the Quorn vegan pieces, halved tomatoes and olives. Cover with foil and bake for 15 mins or until piping hot, remove the foil for the last couple of minutes of cooking. Sprinkle over the fresh thyme and basil leaves and season to taste.